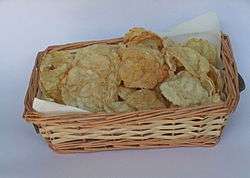 Emping are a type of Indonesian chips, a bite-size snack kripik cracker, made of melinjo or belinjo (Gnetum gnemon) nuts (which are actually seeds). Emping crackers have a slightly bitter taste. Emping snacks are available in markets plain (original), salty, or sweet, depending on the addition of salt or caramelized sugar. Raw (unfried) emping are usually only available in Indonesian traditional markets, while in snack stores, supermarkets, and restaurants only pre-packed, ready to eat emping are available. Most emping are plain flavoured (original), served with a pinch of salt. Emping have been exported to the USA and the Middle East. ↑ "Emping Melinjo Manis (Indonesian Sweetened Paddy Oats Crackers)". 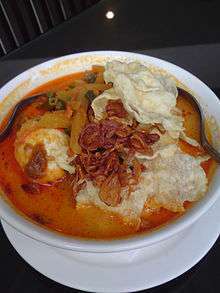 Indonesia eats. 23 May 2011. Retrieved 2 July 2012. ↑ "Emping Khas Karangtawang Diminati" (in Indonesian). Kuningan News. 2 July 2012. Retrieved 2 July 2012.